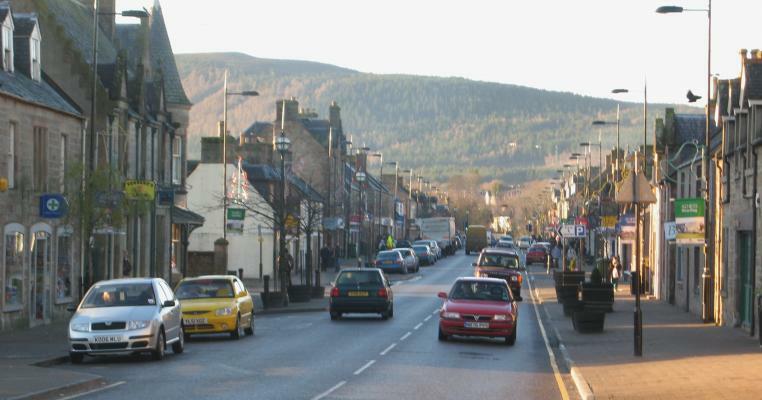 Alness High Street @ High.St - High Street shops and High St businesses. Large Google map of Alness High St.
Alness was formed into the town we know today from two parishes, Alness and Rosskeen, that sat either side of the River Averon. The town has connections with Charles Macintosh, whose father lived in nearby Newmore. Macintosh invented waterproof material in 1824. This was originally intended to make tents but once the potential was seen, he quickly turned the material into clothing; best known simply as the 'mac'. In 1985 Alness Business Association was formed and a lot of effort helped put Alness on the map. The Alness Community Association ran the Scottish Pipe Band Championship in 1989 and attracted over 100 bands 10,000 people. In 1992 they held a second Pipe Band Championship with similar results. In 1995 a group of volunteers got together to improve the High Street, work which included incorporating plants and flowers throughout. Now Alness is known throughout Britain for its summer beauty. Since 1997 Alness has won outright Scotland in Bloom 4 times and was the Champion of Champions, Britain in Bloom 2006. In 2000 the Association bought premises on the High Street Alness and created the Alness Heritage Centre, which is always popular with visitors. All this and more information can be found at the Alness Association's own community website. Detailed maps and information from RPA Smith Street Maps web site.